Strachur Medical Practice now has a BASICS immediate care scheme running for the practice area. The British Association for Immediate Care is a charity supporting doctors who give their time voluntarily to provide cover for emergencies. Like other BASICS doctors across the UK, Dr Coull, who is an experienced Immediate Care doctor, is providing his time voluntarily to respond to any emergencies or 999 calls in the area. Dr Coull has the Diploma in Immediate Care and has completed a certified blue-light driver training course. 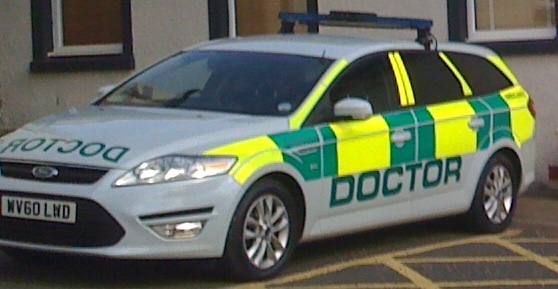 The ambulance car is fitted with special emergency equipment (including a defibrillator) and a stretcher. It is insured to carry patients and it is fitted with blue lights and a siren. It has a Scottish Ambulance Service transponder which allows ambulance control to track its movements. Currently the vehicle is available about a third of the time, but we hope to encourage more doctors in the area to take the additional training and volunteer to respond to emergencies. The ambulance car has been bought and kitted out by R K Coull Ltd - Dr Coull's family business. This allows it to also be used for things like event cover which can help cover the costs of the vehicle and equipment. Strachur Medical Practice will be open as normal today from 9am until 1pm. The BMA doctors' strike being held today means that doctors across the UK will be providing urgent and emergency treatment only today. We only provide urgent care on a Thursday normally, so the strike will not affect us. The reception and dispensary will also be open as normal today.